This luxury, self-sufficient, 33 meter expedition vessel benefits from its beginnings as a stout commercial vessel built to ply the demanding waters of the Baltic Sea. It was built in 1990 to withstand the rigors of tough duty and then converted in France and relaunched in 1999 as a luxury expedition yacht. 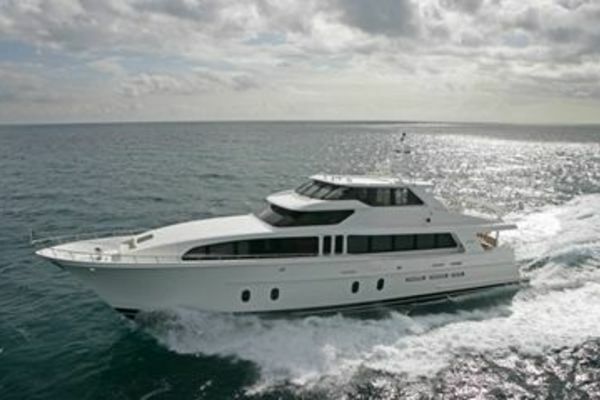 Since that time, it has been refit and continuously upgraded and professionally maintained. Now it is ready to take its new owner to anywhere in the world in safety and style. The boat was dry docked in summer of 2017 for extensive scheduled maintenance and received a new paint job (from gray to blue). Too many service items to mention here. Please email for a complete list and for access to an extensive library of over 100 photos. This boat is in turn-key condition and ready for your global adventure. Available throughout the internal and external living areas on the bridge deck and the flydeck, the Sonos Music System has a wide selection of music that can be controlled from the hand-held wireless remote controls. iPod docking stations. The Sonos system permits you to select different library sources for different zones, concurrently. The master cabin and all other staterooms have access to around 900 movies and 6000 songs served through the Mitec media player. Each stateroom has a Samsung LCD flat screen TV (32 inch in the Master and 26 inch elsewhere). The Audiovisual lounge has a 42 inch Samsung Plasma TV, and as well as the Mitec Media Player with approx. 900 movies. There is also a satellite TV service and a DVD player/recorder.